A higher mileage tire with a sense of style. With its ultra-wear-resistant tread compound, large pattern interior tread blocks, and heat-releasing shoulder design, the DH2 is engineered to go the distance — quietly, stylishly and with a great wet-road grip that keeps you stable in the rain. 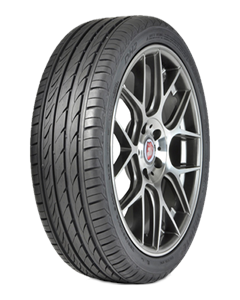 The DH2 is a quality all-season performance touring tire that is manufactured with a special tread compound that decreases rolling resistance. It is manufactured in over 60 sizes, so it can serve a full-range of passenger, SUV and crossover vehicles. The DH2 comes complete with a long-life, 40,000 mile limited tire warranty. Our asymmetric 5-pitch tread pattern is designed to blend the requirements of dry grip and water dispersal, giving the driver a larger contact area and consistent wear for longer tire life. Larger tread ribs/blocks on the outside increase cornering stability while smaller inner blocks aid in dissipating water. The grooves evacuate water and enhance longitudinal traction to prevent lateral slide improving wet driving performance. Integrated heat-resisting bars in the shoulder reduce irregular tread wear and dampen wind noise. This highly stable shoulder profile also pays off in great high-speed cornering.